What is the name of this man made feature? 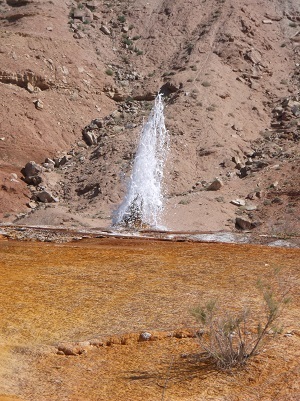 This geyser was formed when an exploratory oil well was drilled nearly 2400 feet deep. Many vandals have since thrown in rocks and other objects, so the geyeser is only about 600 feet deep now. The debris has also hinders the eruptions of this cold water Carbon Dioxide geyser. Where can this pictograph be found? 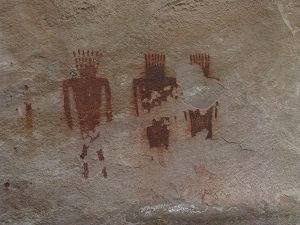 These pictographs are found near Jone's Creek in an area called Deluge Shelter. Where can you see this granary? 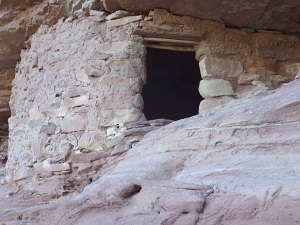 One of the more protected and seldomly seen structures along the Green River between Mineral Bottom and the Confluence with the Colorado River. Check out one of our Hiker's Special trips to see this granary. 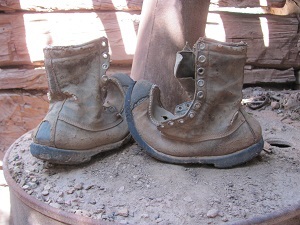 Where can these old boots be found? Who knew that leather could hold it's shape so long? There are many other artifacts on display at the Rock Creek Ranch, including cooking tools, farming implements and other things that were used daily by the cowboys at the Rock Creek Ranch. 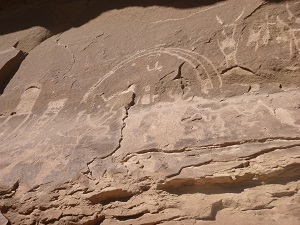 Where can you find these petroglyphs? Where can this inscription be found? 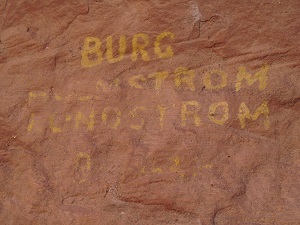 This was left by Amos Burg, Buzz Holmstrom and Phil Lundstrom in September of 1938. Where is this ancient dwelling located? 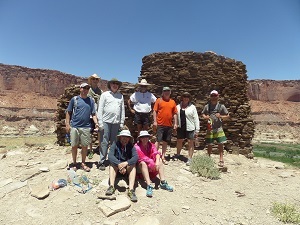 If you love hiking, you'll love the 6 day Hiker's special trip on the Green and Colorado Rivers. 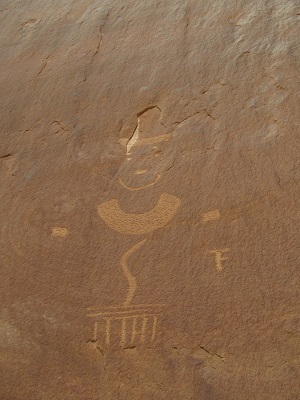 Where can you find this petroglyph panel? 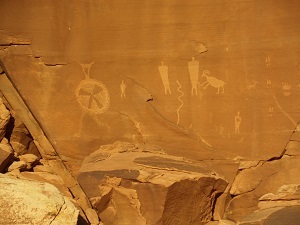 Petroglyphs and Pictographs...what is the difference? 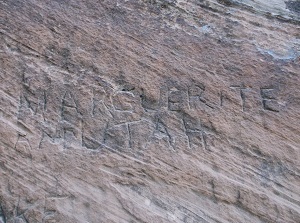 Petroglyphs are carved or pecked into rock surfaces. Where is this inscription found? While these inscriptions are quite fun to find out in the middle of nowhere, and are now pieces of history, it is illegal to leave similar markings now. Arches National Park and Canyonlands National Park are working hark to educate people about the damage that these tags do to the pristine beauty of the parks. Removing even a small inscription takes a lot of time and is quite difficult to do without damaging the stone. Please, leave only footprints, take only pictures.